Athena Huffington thought she could get away with murder. 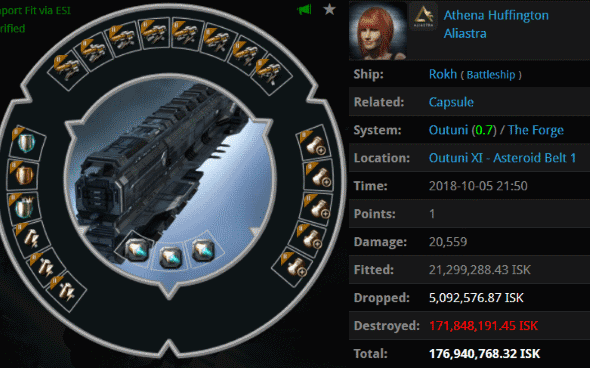 Her mining battleship (*shudder*) was octuple-anti-tanked. But Athena compensated for that flaw with a capacitor tank. So it's a total mystery how her ship managed to die. Agents Max August Huffington, Alt 00, Augustus De Morgan, Alt Proxy, Celeru, Niels Henrik Abel, Ernst Steinitz, and Alt 0 somehow overpowered the capacitor tank--through sheer force of will, one supposes--and gave the horribly abused battleship some peace at last. Hey, you know what would be really funny? What if you took a freighter into a random system like Kusomonmon and got ambushed by nearly 50 gankers? That was the hilarious fate of Bubbaburt, who found himself target practice for a giant armada: Agents Tax Collector Kittens, Taxman Daniel, Australian Excellence, Pod Destroyer Molly, Tax Collector Max, Tax Collector Aruka, Extremely Jumpy Mango, Tax Collector Richard, Tax Collector Fuemi, Tax Collector KarlMarx, Tax Collector Alison, Tax Collector HongMei, Tax Collector Larry, Benji Rackner, Tax Collector Shardani, Professional Pilot Instructor, Tax Collector AynRand, Catalyst Whisperer, Georgia Rackner, Tax Collector Stroheim, Tax Collector BokChoy, Rebecca Rackner, Infinite Devotion, Tax Collector Hill, Kirra Rackner, Fruit Loop Enthusiast, Jani Rackner, Ashlee Rackner, Whale Harpoon, Emily Rackner, The Kitchen Samurai, Tax Collector Buck, Kullanmuru, Hot Salt, Pleb Tea, Jemma Rackner, Hide Yo Freighters, Tax Collector Yuna, Olivia Rackner, Tax Collector Kimi, Zoe Rackner, Ship Insurance Liberator, eviserater Adoudel, Charlotte Rackner, Kimberly Rackner, Ivy Rackner, Globby Rackner, and holdmybeer. Diagram Oksaras was a quite a boor this week. He had the poor taste to take a 21.9 billion isk Bowhead and autopilot it into the historic Kamio system. The good news is that he was promptly corrected by better men than himself: Agents Shy Elf Trap, Daniel Chanline, tumblr ptsd, patyooki, James BIG BONED, erobb, oink piggu, PogChampion, brainlet, Opec, Serious Web Developer, Raijin Naom, Hoppipolla, Neutie McNeutface, Tauso, CALLMEDAVE F1, Edward Abraham, Alexx Twin, and 0pec. These Deep Space Transports are getting ridiculous. 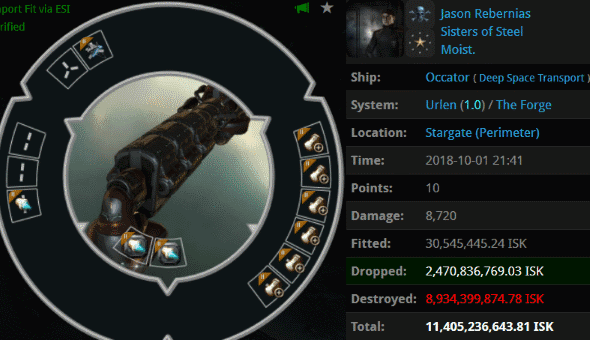 Jason Rebernias had 11.4 billion isk worth of stuff to haul, so he made sure to anti-tank his Occator as much as he possibly could. Jason left two of his midslots empty; he didn't want to burden his ship with any more hitpoints than it already had. Having perfectly set himself up for failure, Jason was blapped by a pair of Tornadoes piloted by Agents Gandor Ironfist and iZaEaRl. 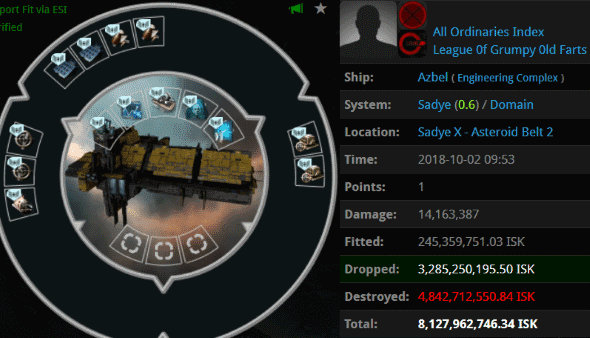 All Ordinaries Index corp of League 0f Grumpy 0ld Farts alliance found itself on the receiving end of a number of wardecs. 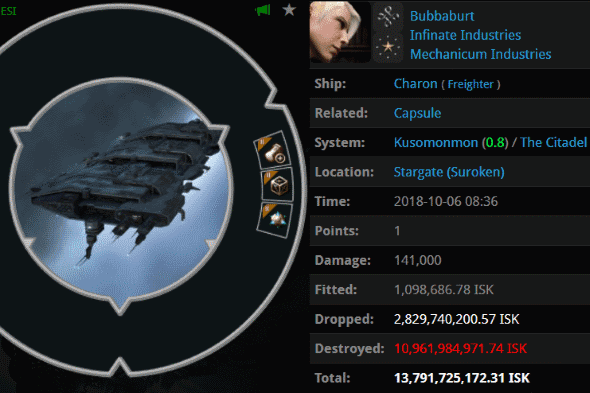 As a result, its 8.1 billion isk engineering complex came under attack by an extraordinary joint fleet consisting of Mercenary Coalition, P I R A T, and, of course, the New Order. No doubt the carebears who lost their Azbel joined the chorus of "Remove wardecs now! For the sake of new players!" The fleet in question: InnerDrive, Gwen Dash, Kaikka Valeeva, Maralek, B RooTs, fisho, Numitor Eto, Joshua Foiritain, Rivr Luzade, Slate Ambramotte, Olan Draselac, Rob Locksley, Vadim Drago, Soliic Malitar, Khromius, Anara Rital, Lass Suicide, Thor Odin, Leto Z'hansu, Tiran Taranovich, Jeronica, Han Renbai, HANDY ST0NER SMURF, Pod Destroyer Molly, Tax Collector HongMei, Christopher Bellini, Australian Excellence, Tax Collector BokChoy, Taxman Daniel, Tax Collector Kimi, Tax Collector Kittens, Tax Collector KarlMarx, Tax Collector Stroheim, holdmybeer, Tax Collector Buck, Tax Collector Alison, Tax Collector Shardani, Tax Collector Hill, Tax Collector Fuemi, Tax Collector Max, Benji Rackner, InnerSphere, Herring, Jacks'Grouse, Rebecca Rackner, Tax Collector Yuna, Jarl Muorin, Whale Harpoon, Jani Rackner, Rhomnir Korba, Extremely Jumpy Mango, Kirra Rackner, Tax Collector Richard, eviserater Adoudel, Tax Collector Larry, Fruit Loop Enthusiast, Celestia Rackner, Tax Collector Aruka, Tax Collector AynRand, anthrobeau, Barth3zzzNL, Catalyst Whisperer, Ashlee Rackner, Charlotte Rackner, Olivia Rackner, Globby Rackner, Infinite Devotion, Zoe Rackner, Jemma Rackner, Georgia Rackner, Yan Rackner, Kimberly Rackner, and Professional Pilot Instructor. 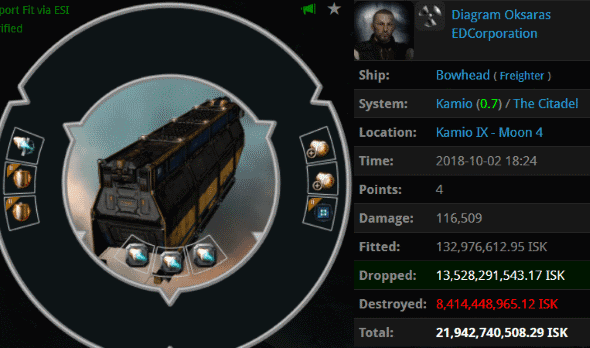 Darkmeia went to Uedama and did what bot-aspirants do there: She went AFK and lost a 6.8 billion isk Bowhead. 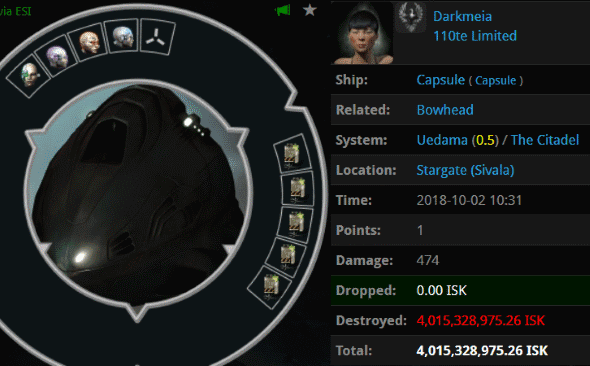 Agent holdmybeer was on standby with a smartbombing Maller--costing Darkmeia another 4 billion isk. 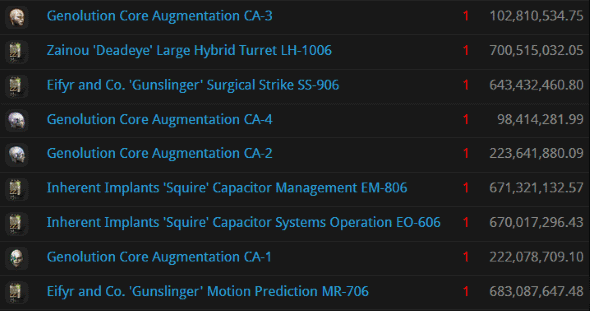 That's an odd set of implants for a Bowhead pilot. Now Darkmeia has no Bowhead and no implants. A much better match, I would say. Now that is an A grade podkill. Yes, all killmails here are fake and made up.